"The German expressionist painter and printmaker was one of the founders of the artists group Die Brücke or ""The Bridge"", a key group leading to the foundation of Expressionism in 20th-century art. He volunteered for army service in the First World War, but soon suffered a breakdown and was discharged. In 1933, his work was branded as ""degenerate"" by the Nazis and in 1937 over 600 of his works were sold or destroyed. In 1938 he committed suicide by gunshot. 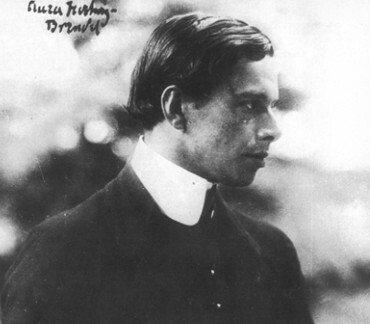 In 1913, the first public showing of Kirchner's work took place at the Armory Show, which was also the first major display of modern art in America. In 1921, U.S. museums began to acquire his work and did so increasingly thereafter." Expressionist, Gründungsmitglied der ‚Brücke’ (1880-1938). 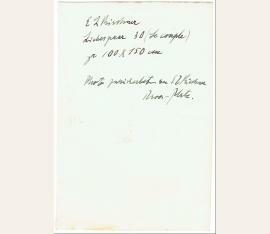 Autograph postcard signed („E L Kirchner“). Davos. 1 S. 8vo. Letter to K. W. Senn about a meeting they will have on Thursday. 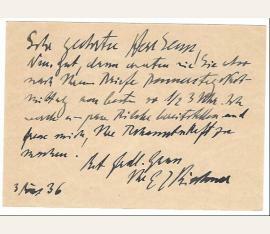 In part (translated): “I will provide some paintings, and I am glad to get acquainted with you.” In fine condition. 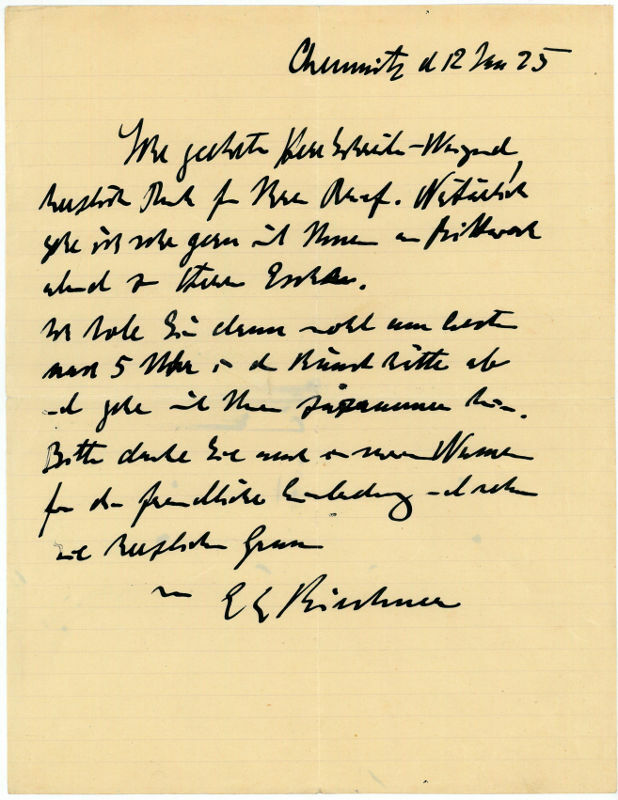 During the period he wrote this letter Kirchner became increasingly disturbed by the rise of the Nazis in his homeland (he had moved permanently to Davos, Switzerland, in 1918), and news of their attacks on modern art threw him into a deep depression. The Nazis branded his artwork as ‘degenerate’ in 1937 and confiscated all of his paintings on display in public museums, which amounted to over 600 works; Kirchner would commit suicide the following year. A rare piece from the early stages of this tragic era in art history..
Maler und Graphiker (1880-1938). Eigenh. Bezeichnung und 2-facher Namenszug auf der Rückseite einer Photographie. Davos-Platz. 225 : 154 mm. 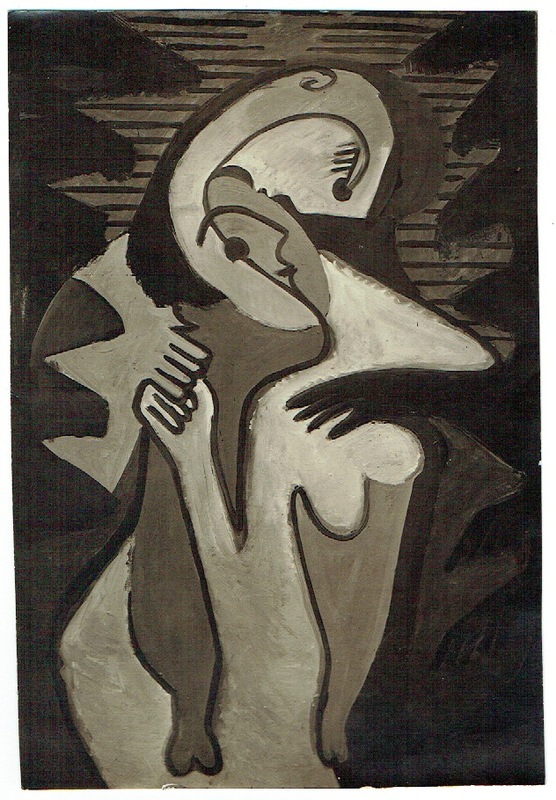 „E L Kircher | Liebespaar 30 (Le couple) | gr 100 x 150 cm | Photo zurückerbeten an E L Kirchner | Davos-Platz.“. - Die Vorderseite zeigt die Photographie von Kirchners Gemälde „Liebespaar“. 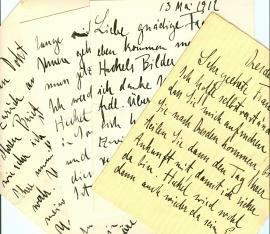 Maler und Graphiker (1880-1938). Eigenh. Manuskript (Fragment). O. O. u. D. 1 S. 8vo. Beschreibung eines Traumes: "die Bauern aus seinem Dorf suchen in einem reifen Maisfeld seine Leiche. Giovanni der Bauer von nebenan nimmt einen ganzen Maisstock und öffnet der Längseite [sic] entlang den Schaft im innern [sic] kommt das Bein der Leiche zum Vorschein und oben wird ein grosser weisser Phallus sichtbar. Ich erwache ganz plötzlich. Maler und Graphiker (1880-1938). Eigenh. Brief mit U. Chemnitz. 1 S. Gr.-4to. An Friedrich Schreiber-Weigand, den Direktor der Kunstsammlungen Chemnitz, betr. einer Abendeinladung. - Geschrieben während eines Besuches bei seiner Mutter zur Jahreswende 1925/26: "[…] Natürlich gehe ich sehr gern mit Ihnen am Mittwoch abend zu Herrn Esche. Ich hole Sie dann wohl am besten nach 5 Uhr in der Kunsthütte ab und gehe mit Ihnen zusammen hin. Bitte danken sie auch in meinem Namen für die freundliche Einladung […]". 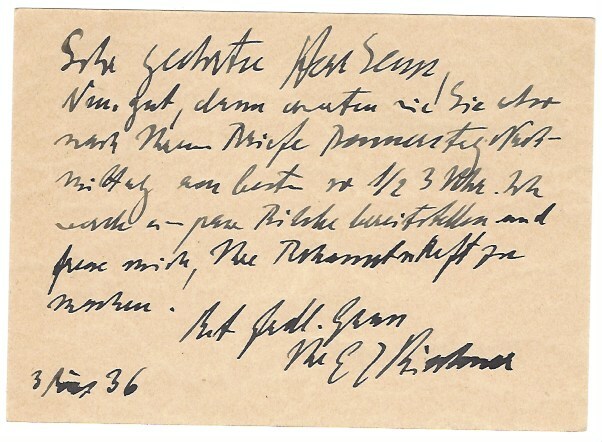 - Während der erwähnten Abendgesellschaft in der von Henry van de Velde erbauten Fabrikantenvilla Herbert Esches kam es, nach Jahren der Entfremdung, zu dem bekannten Zusammentreffen mit Karl Schmidt-Rottluff. 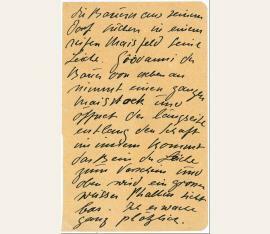 5 e. Briefe mit U.
Ernst Ludwig Kirchner (1880–1938), painter. ALS. 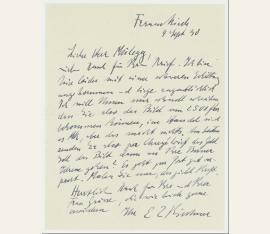 Frauenkirch, 9 March 1920. 5 pp. Large 4°. With quarter-page original drawing. – In German. 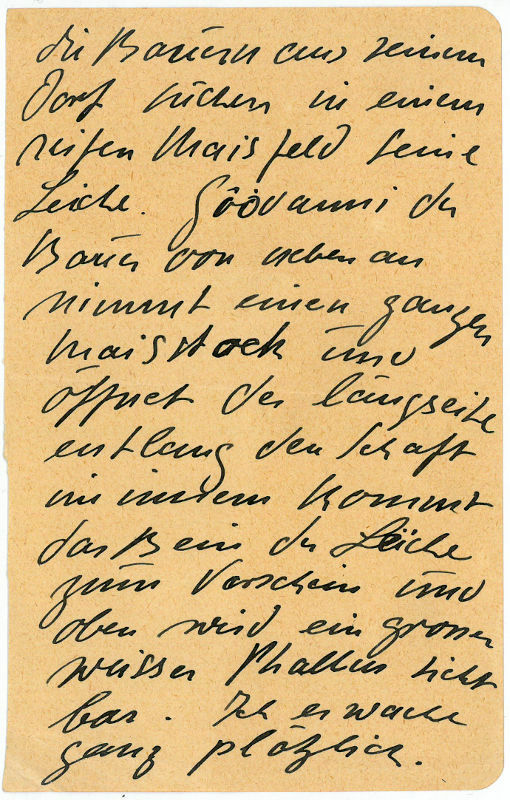 Long, important letter to Maria Schmidt(-Hell) in Magdeburg, wife of the art historian Paul Ferdinand Schmidt, then assistant director at the Kaiser-Friedrich-Museum and later director of the Municipal Collections at Dresden. 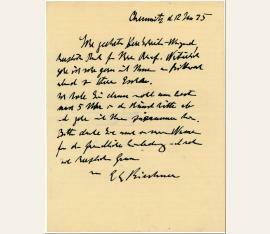 – Written after the separation between Maria Schmidt and her husband, after Kirchner’s nervous collapse in 1915 and his emigration to Switzerland: “As I have been living in great seclusion for many years due to my ailment, I had in fact not heard of your fate, and yet I knew even then that you were the driving spiritual force in the ‘Haus zum Wolf’. I endured hard years, after which my body finally broke down, so that I am today reduced to a wreck without hope of recovery. The only thing that keeps me going is my work. I admit I have progressed in this respect through my very suffering, almost reaching the point at which I am unable to communicate with the outside world. But I would like to answer your question and tell you what could be the path, according to my belief, that you should choose in weaving. ‘Modern art’ is lacking in a proper surrounding for interior decoration, especially in carpets. You know that to this day one has no choice but to use the oriental carpets in modern European rooms. You know that these are now so rare and so expensive that soon there will be no more. Also, they are outdated when it comes to the modern paintings. I assume you also know how these carpets developed: the oriental women transformed in their minds the artistic forms before them, dreamed of them, transmuted them and almost subconsciously let them flow through their hands, back into the ornament of their patient day-by-day carpet work. They thus produced a new work of art, entirely pure, entirely sensual, and yet feminine, by merging with the art of their times. Today, there is great need of something similar, and there probably is no greater task than this: to make today’s art come alive. I therefore do not envisage you mechanically copying a picture or outline, but rather suggest that you, guided by the technique of weaving, weave into the carpets the colors and especially the designs which you see before your mental eye, inspired by pictures that you like. You would thus have the freedom of creation based on all your feelings. The starting point of your work would be a certain series of colors, for instance blue red pink black or green yellow orange brown or whatever [...] [Kirchner inserts a pen-and-ink sketch of a carpet, c. 90 x 210 mm] [...] I do not know whether I have expressed myself clearly or whether this type of work is even agreeable to you. Of course, there are a thousand possibilities. As I have led such a secluded life for so many years, I unfortunately do not know of any painter whom I could name with any certainty who is truly interested in such things. As far as I can see, most of them have become horribly uneducated and shiftless through success which now comes so easily [...]”. Eigenh. Brief mit U. 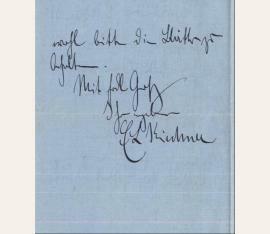 ("E L Kirchner"). To the Berne painter Alexander Müllegg (1904-82), who wanted to buy a painting: "Unfortunately, I arrived with a severe cold and had to lie down immediately. I just want to tell you quickly that you can have the painting for 2500 frcs, in the trade it's the same price in German marks, but that makes no difference. The best way to send the money is by registered mail [...]" (transl.). The painting is presumably Kirchner's 1925 self-portrait (Gordon 802). Ernst Ludwig Kirchner (1880-1938), Maler. E. Brief m. U., Dresden, 20. 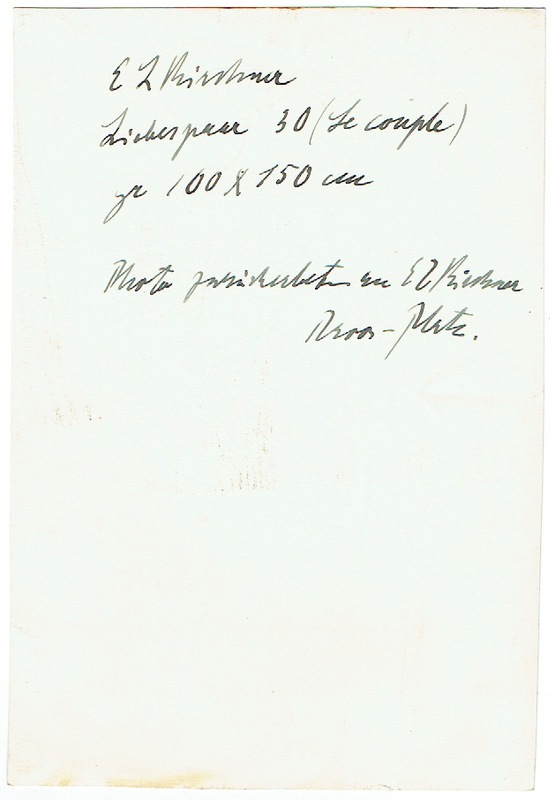 Dezember 1909, zwei Seiten gr.-8°. Doppelblatt. Blaues Papier. Aus der frühen Dresdener Zeit, vier Jahre nach der Gründung der „Brücke“, an einen „Herrn Doktor“, der um Fotografien für einen Artikel gebeten hatte: „[…] beiliegend sende Ihnen zwei Photos meiner beiden Arbeiten, die Sie seinerzeit in Ihrer freundlichen Kritik erwähnten. Wenn sie für Sie von Interesse sind, darf ich Sie wohl bitten die Blätter zu behalten. […]“. Selten.